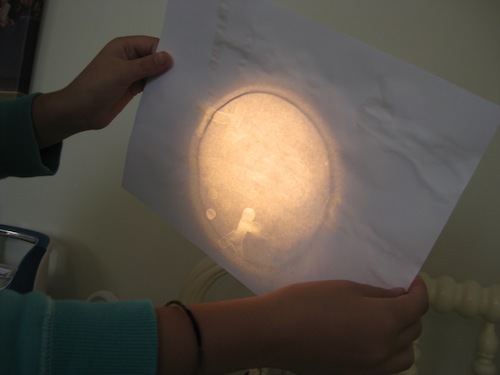 How many of us have been sorely disappointed with the lemon-juice-and-candle invisible ink of myth and legend? If your attempts were like mine, the paper would catch fire before a message appeared. Besides, any secret messages written under careful adult supervision kind of defied the purpose. In theory, a hot light bulb will achieve the same effect. In reality, not always – especially with today’s energy-saving bulbs. Just to be sure we remembered our previous failures correctly, my brave assistants and I set to work with lemon juice and a light bulb. As we suspected, little happened, other than my assistants growing bored with the entire process and wandering away. But fear not, my secret-message-writing friends! A tipster pointed me towards an invisible ink that does, in fact work each time. Better still – no flames or hot bulbs are required, making this experiment one that does not need extinguishers at the ready. 2. 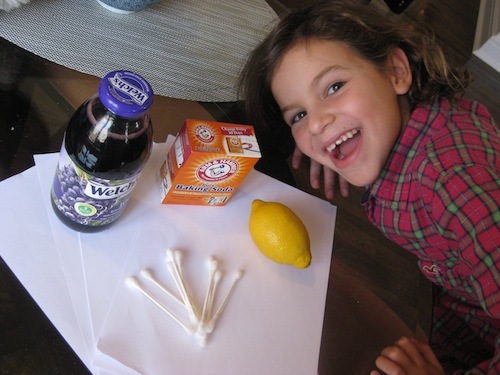 Dipping the Q-Tip into the baking soda mixture, paint your secret message onto the paper. 3. Let the paper dry thoroughly. 4. 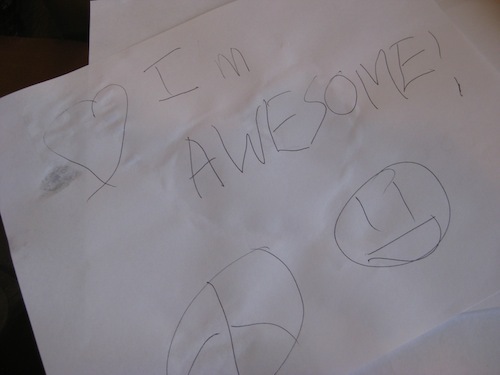 Write a decoy message across the paper. This writing will obscure your tell-tale wet marks. 5. 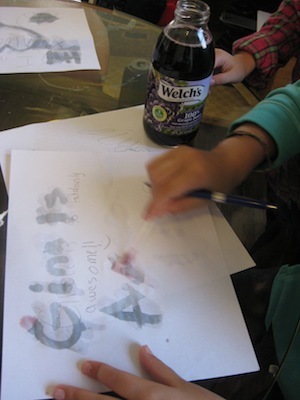 Once the paper is dry, paint over the paper with the grape juice. Et Voila! Your secret message appears! The baking soda and water solution is a base, while the grape juice is acidic. The two react, turning a gray color. Here and here are mostly kid-friendly explanations of PH Levels, acids, and bases. I wonder what else might work, using the acid/base combo – perhaps a little home experimentation might offer some solutions? Aha! The decoy message is what we’ve been missing when I’ve tried this at home with my kids. We’ll try again and see how it goes. Thanks for the tip.